Secretary of Defense James Mattis provided the White House this week with a new policy regarding the transfer of detainees to the detention center at the Guantanamo Bay Naval Base in Cuba. President Donald Trump signed an executive order in January keeping the detention center open and calling for guidance from the defense secretary within 90 days. The Department of Defense said in a statement it has obliged, putting forward a policy recommendation one day after the deadline, CNN reports. The department is not making the details public at this time. "The Secretary of Defense has provided the White House with an updated policy governing the criteria for transfer of individuals to the detention facility at US Naval Station Guantanamo Bay," Pentagon spokesperson Cdr. Sarah Higgins said. She did say detention at Guantanamo depends on a detainee presenting a "continuing, significant threat" to national security. 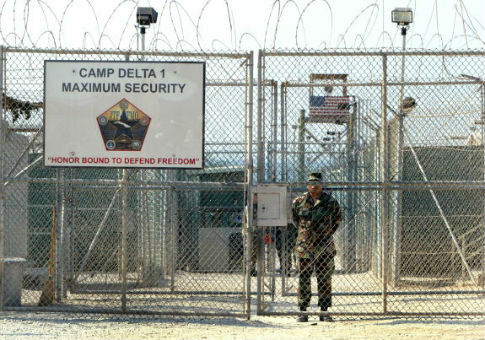 "This policy provides our warfighters guidance on nominating detainees for transfer to Guantanamo detention should that person present a continuing, significant threat to the security of the United States," Higgins added. Mattis has said in the past that the process of detaining foreign fighters is complicated. "We have been engaging with their home countries. Home being the country they were a citizen of when they left to go fight. Now, in some cases, those countries have stripped them of their citizenship, so they have a different view as far as what their status is today. So this is not simple," Mattis said. He also said it was "principally" the responsibility of the State Department to determine how those detainees are handled. In his State of the Union address three months ago, Trump declared his intention to put captured ISIS and al Qaeda terrorists in Guantanamo. "I just signed, prior to walking in, an order directing Secretary Mattis … to re-examine our military detention policy and to keep open the detention facilities in Guantanamo Bay," Trump said. "In the past, we have foolishly released hundreds and hundreds of dangerous terrorists, only to meet them again on the battlefield – including the ISIS leader, (Abu Bakr) al-Baghdadi, who we captured, who we had, who we released," Trump also said in the speech. This entry was posted in Politics and tagged Department of Defense, Guantanamo, James Mattis, Trump Administration. Bookmark the permalink.